It’s one thing for indignant seniors (or anyone nearing retirement) to defend the crappy returns they get on their lifetime Social Security payroll taxes … er, contributions, against the arguments of reformers. It’s another for younger individuals to rant about the threat to the crappy returns they will get while resisting an idea for reform that would almost certainly improve their eventual well-being: privatization. Both of the aforementioned reactions are marked by confusion over the use of the word “entitlement” in federal budgeting, though in another sense, entitlement is manifested in the very defensiveness of the reform critics. At its root, this self-righteous naiveté is a product of ignorance about the program, its insolvency, how its rewards compare to private savings, and longstanding media propaganda favoring big government as grubstaker… because it feels virtuous. 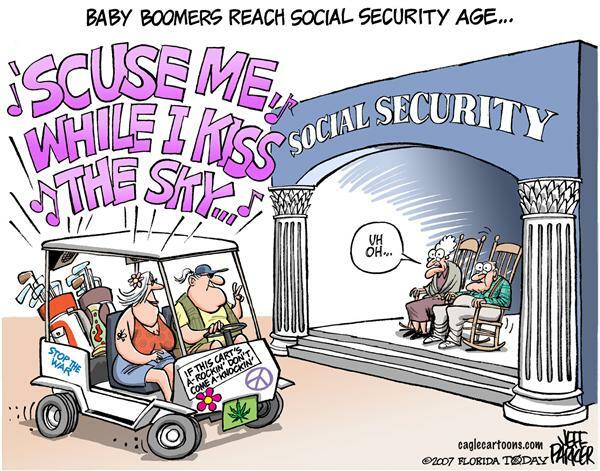 There’s really not much to like about Social Security, though the status quo will always appeal to some. Insolvency: The trust fund held $2.7 trillion of reserves at the end of 2016, but benefit payments are growing faster than contributions (plus interest on the public bonds held by the fund). The wave of retiring baby boomers and increasing longevity (and a declining number of workers per retiree) are placing a strain on the system. According to the trustees, depletion of the fund will begin in earnest in 2022, and the Old Age Survivors and Disability Insurance (OASDI) fund will be exhausted by 2034. This might be delayed if the economy and employment grow faster than expected. The actuarial deficit through 2091 is $12.5 trillion, as Brenton Smith notes in this post. The returns are lousy: Two years ago, I posted an examination of the returns earned on Social Security “contributions” in: “Stock Crash at Retirement? Still Better Than Social Security“. The title is an accurate summary of the conclusions. “Suppose you are given an option to invest your FICA taxes (and your employer’s contributions) over your working life in a stock market index fund. After 40 years or so, based on historical returns, you’ll have stashed away about 12 – 18 times your total contributions (that range is conservative — 40 years through 2014 would have yielded 19x contributions). A horrible preretirement crash might leave you with half that much. At the low-end, you might have as little as 4.5 times contributions if the crash is as bad as the market decline of 1929-32. That would be very bad. Reforms? The prototypical reform proposals always involve cutting benefits or raising taxes in one way or another. No wonder there is so much suspicion among the public! For seniors and near-retirees, the lousy returns noted above are at least fairly certain: generally, reform proposals haven’t applied to those of age 55+. Nonetheless, those projected returns are not a promise. There is a risk that the benefits could be changed or eroded by Congress, as discussed here by Lance Robert. For youngsters, the returns are much more uncertain, and changing the structure of distant benefits is always more politically palatable. Examples of typical reform proposals include delaying the age at which benefits can be claimed, increasing the income cap on payroll taxes, and changing the way in which benefits are indexed to inflation. Many of the “new ideas” shown at this link are variations on finding additional tax revenue or delaying benefits. Rep. Sam Johnson has proposed a set of fairly conventional reforms, including gradual increases in the retirement age and elimination of the earnings test, so that some income could be earned without reducing benefits. Also, Johnson’s plan would redistribute benefits toward low-income beneficiaries. AARP provides a summary of 12 proposals, one of which is to index benefits for life expectancy at each age: as expected longevity increases, annual benefits would decrease. There are other proposals with a strongly redistribution aspect, such as reducing benefits for those with high lifetime earnings or means-testing benefits. Better ideas: There are currently some incentives in place for retirees to delay benefits for a few years, and some of the proposals at the “new ideas” link would attempt to strengthen those rewards. Another idea mentioned there is to offer an inducement to delay claims by allowing at least a portion of future benefits to be taken as a lump sum. This is more novel and has greater potential savings to the system in a world with increasing longevity. To the extent that retirees can privately invest at more advantageous returns, they might be willing to accept a substantial discount on the actuarial value of their benefits. The interests of future beneficiaries would be served most effectively by allowing them to choose between contributing to the traditional program or setting a portion of their contributions aside in a private account. These accounts would give individual workers flexibility over investment direction. As discussed above, better returns than the traditional program can be had with near-certainty given sufficient time until retirement. Michael Tanner at CATO is correct in insisting that workers control their own accounts should they opt-out of the traditional program. And the government itself should stay out of private capital markets. It is this proposal that is always greeted with the most vitriol by opponents of reform. The very idea of private accounts seems to them an affront. One explanation is the fear of financial risk, but this would be mitigated by limiting the opt-out to younger workers with adequate time for growth. Another explanation is the fear that lower-income beneficiaries would not fare well under this reform. In fact, there is a strong semblance of redistribution in the system’s existing benefit formulas, but these features do not amount to much once adjusted for the differing life expectancies of income groups and the benefits paid to survivors. There is no reason, however, why the private account option would prevent redistribution through the traditional portion of contributions. Moreover, there is value in creating greater transparency when it comes to redistribution, as it promotes more effective scrutiny. Funding: Unfortunately, the Social Security program has long relied on funding current benefits to retirees with dollars contributed by current workers. This is one of the biggest areas of misunderstanding on the part of the public. Allowing workers to opt-out would improve the long-term benefits received by those retirees, but it would also remove a portion of the funding for current retirees, thus accelerating a portion of the system’s unfunded obligations. A similar acceleration of the funding gap would accompany any reform to discount future benefits in exchange for payment of a lump sums in advance. The tradeoff is favorable over a time horizon lengthy enough to cover the retirement of today’s younger workers, but the near-term shortfall can only be met by reduced benefits, borrowing, or new sources of funds. Asset Sales: The best option for bridging the funding needs of a transition to private, individually-controlled accounts is to sell federal assets. I have discussed this before in the context of funding a universal basic income, which I oppose. The proceeds of such sales, however, could be used to pay the benefits of current and near-term retirees so as to allow the opt-out for younger workers. The asset sales would have to proceed at a careful and deliberate pace, perhaps stretching over a decade or more, but those sales could include everything from unoccupied federal buildings to vast tracts of public lands in the west, student loans, oil and gas reserves, and airports and infrastructure such as interstate highways and bridges. In 2011, it was estimated that the federal government owned $1.6 trillion worth of liquid assets alone. The value of less liquid federal assets would be in the many trillions of dollars. (Read this eye-opening assessment of federal assets.) Of course, these assets would be more productive in private hands. Sustainability: The outrage greeting ideas for entitlement reform largely denies the economic reality of inadequate funding. Social Security is just one example of an unsustainable entitlement program. Few participants in the system seem to realize that their benefits are paid out of contributions made by current workers, or that surpluses of the past were simply borrowed by the government and used to fund other spending. It was sustainable only with a sufficient number of contributing workers to support a stable class of retiree-beneficiaries. It cannot withstand an expanding class of longer-living beneficiaries relative to the labor force. Ideally, reform would address the system’s insolvency as well as the weak returns to beneficiaries on their payments into the system. Self-direction and individual control over at least a portion of invested contributions should be viewed as a long-term fix for both. It will yield much better returns than the traditional system, but for workers this depends on the amount of time remaining until retirement. Young workers can elect to opt-out of the traditional system at little risk because they have the time to invest over several market cycles, but older workers must be circumspect. In any case, it is unlikely that politicians would take the chance of allowing older workers to opt-out, then face a potential backlash after a market downturn. The insolvency problem, and the short-term funding shortfall created via the opt-out alternative, require hard decisions, but asset sales can bridge a large part of the gap, if not all of it. Lump-sum benefit payments might also be made at a savings, but they would worsen the short-term gap between benefit payments and contributions. In the long-run, the tradeoffs would become more favorable as today’s young workers age and retire with the more handsome returns available via individually-controlled and privately-invested accounts. Shrinking the ongoing flow of entitlements is a tall political order. Avoiding the contingencies that would add to existing obligations calls for economic policies that promote stability, rather than boom and bust cycles that follow misguided efforts to stimulate the economy. Still another matter is to deal with the obligations that already exist. Higher taxes, inflation and default do not represent attractive policy options, but our activist government has placed us squarely in that corner.